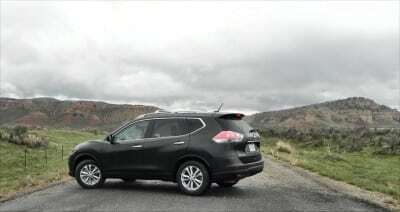 The 2014 Nissan Rogue sees a lot of improvement on an already-great crossover in the small to mid-size segment. The addition of Zero Gravity seating, a more usable third row, and a better-looking exterior design come with high fuel economy, smart ergonomics, and a generally useful, family-friendly, and very well-considered little Rogue of an offering in this contentious segment. 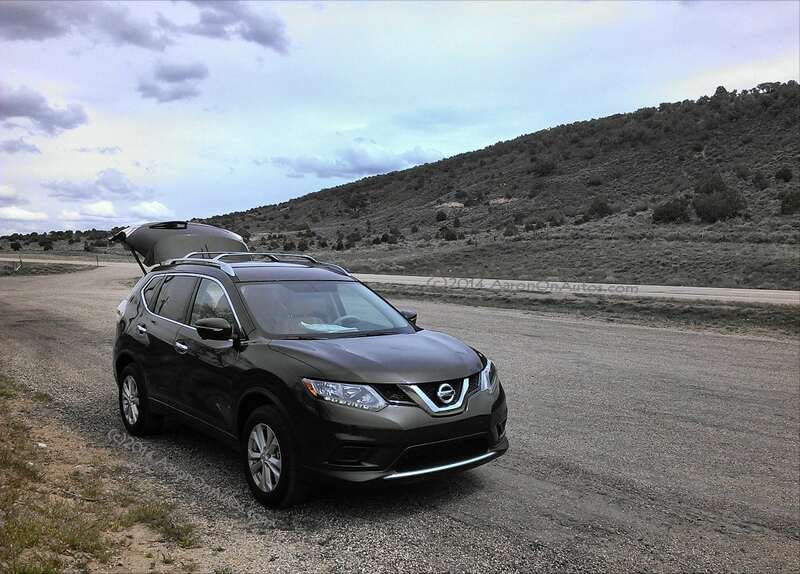 We received the 2014 Rogue on a Monday and set out early Tuesday morning on a road trip from Wyoming to Utah, roughly 550 miles away, arriving that night. 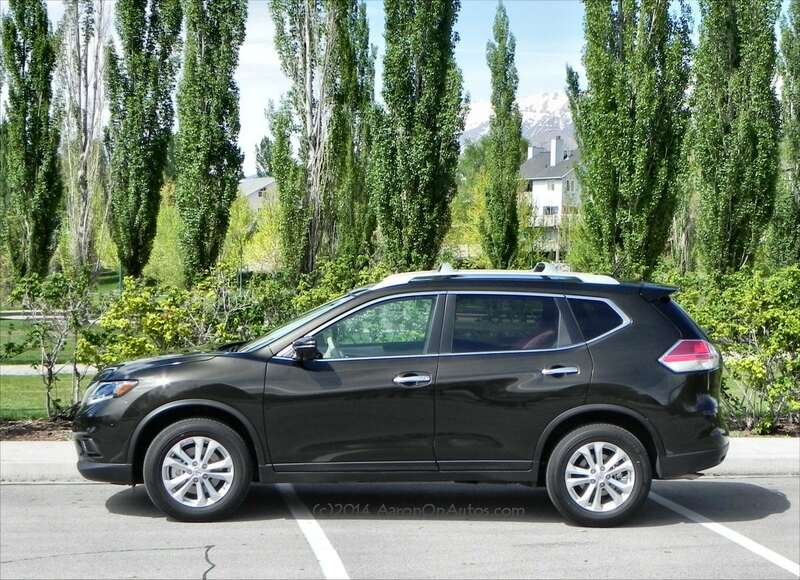 We spent several days in Utah, during which the university town we were in had graduation, which meant a lot of heavy city traffic, highlighting the useful optional technologies our Rogue contained. We returned on Saturday, finishing the #Roguetograndmas trip, which we will detail soon. Our time in the 2014 Rogue was eventful and proved it to be a family-friendly and useful little crossover with a lot more versatility than a first glance might assume. The Rogue’s new look is in line with the rest of the Nissan lineup, with the nose slightly blunted form its former beak-like sharpness, the rear hatch more rounded, and the second door and window getting a coupe-like upward swoop. Our test model had a beautiful Midnight Jade color that is a deep green (nearing black) with golden fleck mixed in. 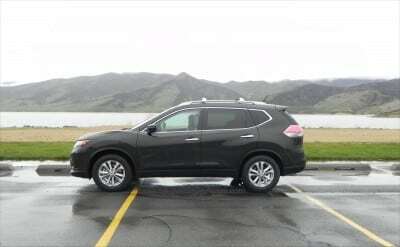 Many small changes were also made to the Rogue’s exterior compared to the 2013 model year, all meant to enhance the sporty look of the crossover a swell as give it a lower-appearing stance for a slightly aggressive appeal. Like most Nissans, the 2014 Rogue has a contemporary, but slightly aggressive look that sets it up for appeal to a broad audience. On our test model, shown above, the SV trim level brings the chrome additions, beautiful alloy wheels, and the optional roof rack package. Inside, the 2014 Rogue is almost completely new. Seating is the Zero Gravity offered first in last year’s Altima (read that review here). This creates a huge amount of comfort for the driver and front passenger, but the second-row sees no slacking in this as well, with very adjustable seats in a 40/20/40 split-fold as part of the EZ Flex Seating System in the Rogue. The optional third row in our family package is very small, but suitable for small children and safety seats to allow adults to have the second row. During our test, we had four full-grown adults and two toddlers in the car with very little cramping. All seating in the second and third rows folds flat for excellent cargo space, which we used to its ultimate in our road trip to Utah. 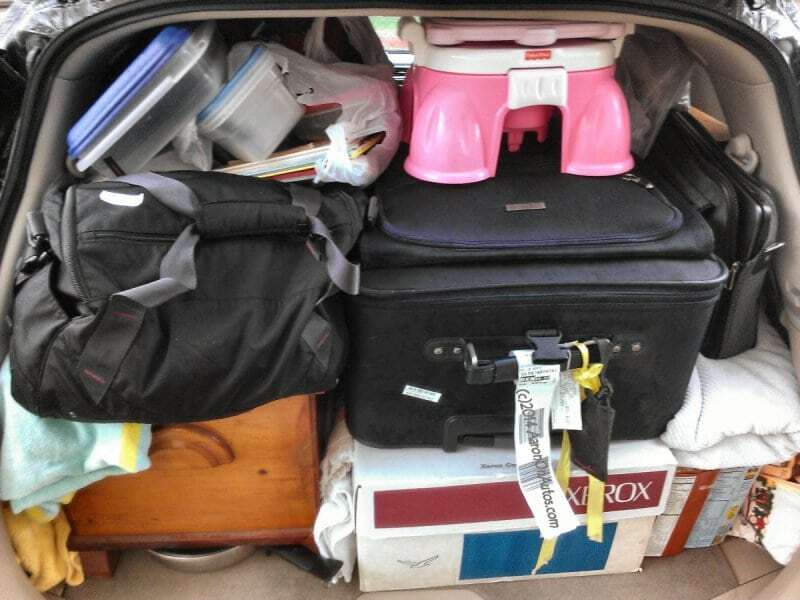 Even with the second row up and slid most of the way back, we were able to get a phenomenal amount of stuff into the cargo area of the little 2014 Nissan Rogue. 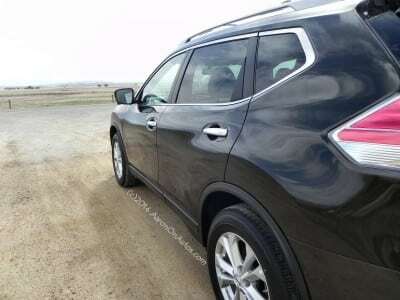 As expected, the NissanConnect infotainment system is top-notch and one of the easiest to use in the industry. Our SV Premium package test vehicle had the full SiriusXM suite and 7-inch display as well. This is a nice option, but still optional and not a real need for a lot of people. 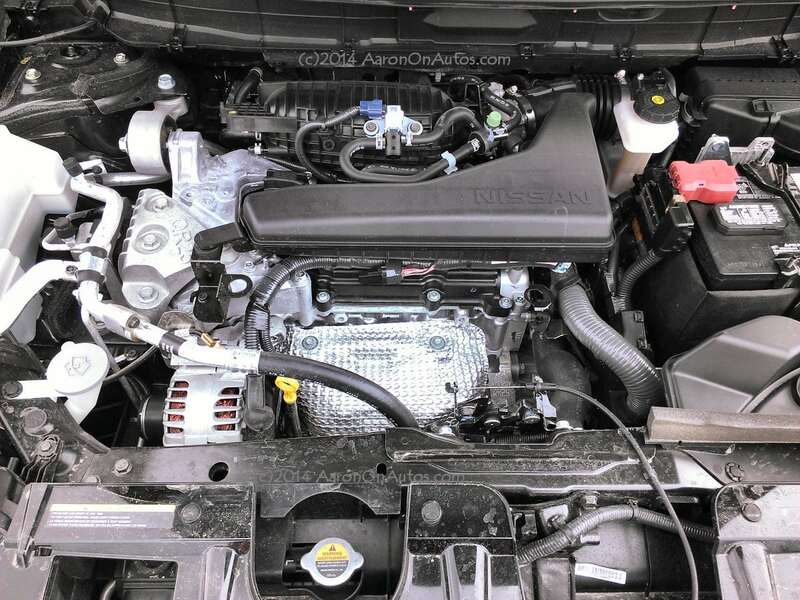 The Rogue is powered by a proven 2.5-liter dual overhead cam (DOHC) inline-four-cylinder (i4) engine that outputs a reliable 170 horsepower and 175 lb-ft of torque. This runs through a new-generation Xtronic continuously variable transmission (CVT) in front- or all-wheel drive – our test model was AWD. 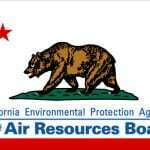 This gives the 2014 Nissan Rogue an EPA rating of 28 mpg combined (25 city, 32 highway). Our test drive was for about 1,100 miles of high-altitude, mountain driving and intense city driving and resulted in an average of 24.6 mpg overall. On the highway, we saw nearly 26 through the mountains and about 27 returning on a more flat trajectory. At all times, the Rogue was fully loaded with passengers and often a lot of cargo. 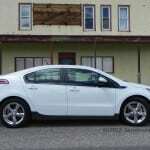 Without the extra weight, we see no reason it could not achieve its 32 mpg highway rating for those who drive carefully. Everything in the Rogue is made for utility and convenience. 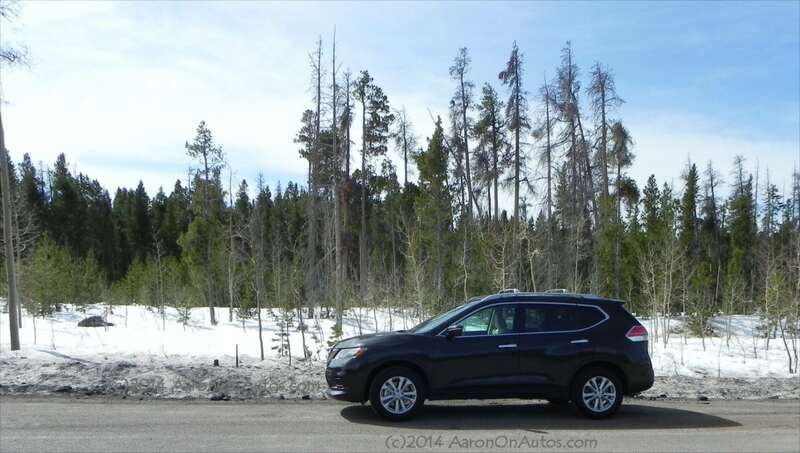 A true family car, the 2014 Rogue is very comfortable on the highway. With all of us packed in, plus a week’s worth of gear for four (including two toddlers), it was spacious and well-considered. 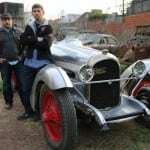 Of the 1,100 miles we put on the car, I personally drove about 900 of them and was never uncomfortable except when pit stops were imminent. During our time in the city, we were in downtown Provo, Utah during graduation week at Brigham Young University. This meant that an already-bustling town had twice the traffic and congestion it usually did. This time in the 2014 Nissan Rogue proved the usefulness of the many parking and safety enhancements the new Rogue employs. Our model included a rear backing camera, Nissan’s ArroundView monitor, lane departure and collision warnings, and blind spot monitoring. All of this came in handy while traversing the thickly-congested city. Parking was especially a breeze in this new Rogue. We had six people in the car at once, utilizing the third row, as well as four people with full cargo and never felt cramped in the Nissan Rogue. This is a testament to the intelligent ergonomics of the new crossover’s design. Although we did not have snow or ice to contend with during our travels in the Rogue, we did have heavy rains and high winds. Not once did we feel unsafe in the 2014 Nissan Rogue with its AWD system. It’s a sure-footed little crossover. 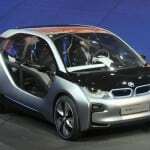 The small-medium crossover segment is very contentious, being the fastest-growing automotive market in the U.S. Key competitors to the 2014 Rogue are the Toyota RAV4, the Mitsubishi Outlander Sport, Subaru Forester and Ford Escape. All of these are strong contenders in the market with different strengths and weaknesses. The RAV4 has more interior refinement, but is less sporty and utilitarian in comparison to the Rogue. The Outlander Sport is just as utilitarian, but less sporty as well while the Subaru Forester is less comfortable but more capable and has a sturdier feel than the Rogue. 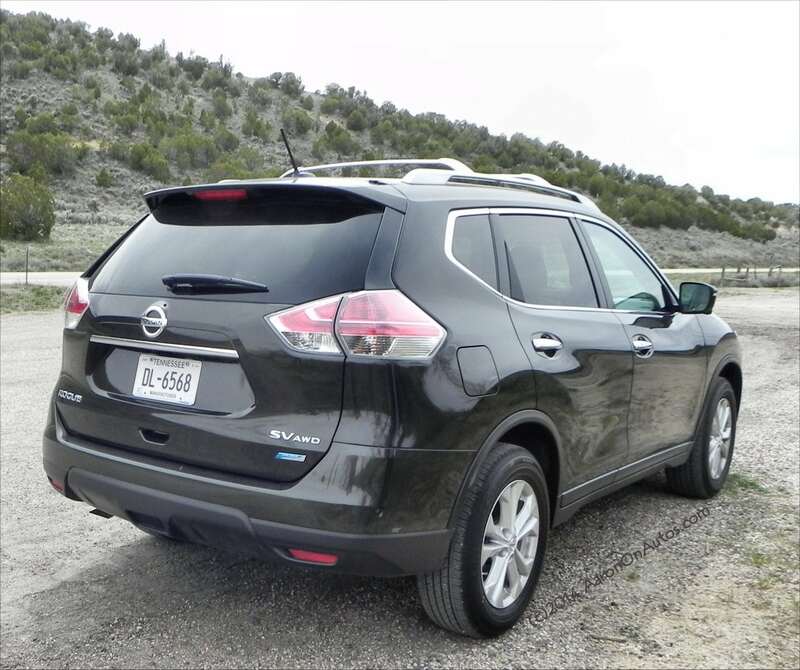 The Ford Escape is overall the closest match to the Nissan Rogue for comparison across the board, but doesn’t have the fuel economy the Nissan boasts without an expensive EcoBoost upgrade. Highly ergonomic and family-friendly with very few things for people to complain about inside and on the road. Very intelligent packaging for various price points and needs, including the new base-level package being sold below the invoice of many contemporaries. Might be small for some families, especially as kids get older. Not really offroad capable, though it is competent in adverse weather. 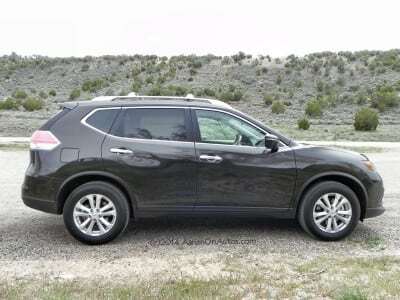 The 2014 Nissan Rogue is a very well-designed, all-around small to medium-sized crossover. It handles itself well, offers plenty of versatility options, and is easy to drive and enjoy. Inside and out, the Rogue is a highly competitive, complete package for a segment that sees some of the best automakers have to offer. The Rogue was a manufacturer’s press loan, which we drove for about a week. Our drive was nearly all highway with a fair amount of busy city driving thanks to our taking it on a near-1,100 mile road trip.